Math exists all around us in almost everything we do, and it's important to stop and use everyday math to help children improve their math skills. When children use math in a real world application, they are far more likely to understand and remember the skill used. This real world application alongside a consistent math regimen allows children the comfort and precision necessary to build a strong foundation in all areas of math. Have fun! Don’t be afraid to make a game out of some of the more mundane math activities such as math fact flash card drills. For every fact a child gets correct, they get to keep that card and later can try to throw their correct cards into a hat or bowl. The more cards they get into the hat, the greater rewards they can earn. Let’s bake! Rarely will you find more math involved in an everyday activity than in baking. Whether it's counting chocolate chips, doubling recipes, or just learning units of measurement, baking will teach children important math skills...and the end result is delicious! Let’s shop! Stores are excellent places to reinforce estimation, percentages through sales or taxes, and money. Include children in every part of the process from budgeting to cost analysis. Let them decide which size package is a better buy at the market or what the price of an item on sale will be. Let’s travel! Using distance, speed, and speed limits, children can find out how long a trip will take. With so much information available online, children can look up the speed of airplanes and find distances from one locale to another. Make a game of seeing if Google Maps has made a correct estimation of travel time. Children can also use math to deduce whether their parents have violated a speed limit or two! Travel games can be used on a daily basis on the way to and from school. Unfortunately, learning math doesn’t always involve yummy treats, shopping, or speeding. Math is one of the few subjects where extra practice and repetition is the key to success. All subjects require understanding, but math requires hard work and diligence at home in order to attain speed, skill, and mastery. There is never any substitution for a child carefully attacking his or her math homework each and every night. 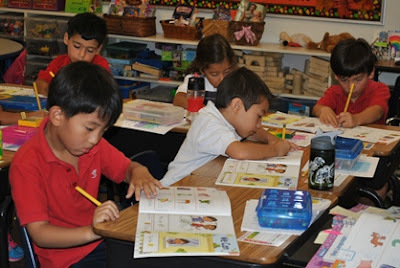 Fairmont provides home access to Accelerated Math and Math Facts in a Flash. * These programs along with excellent math instruction at school have allowed our students to take classes such as Algebra II and Pre-Calculus in 8th grade. *There are other great no-cost or low-cost math apps available such as XtraMath and Operation Math. A love for math needs to be established both at school and in the home. Math can be a burden or an adventure. It is all about the positive attitude we create in the home for our children. If we help keep math entertaining and meaningful our children will be more excited each and every day when math class begins. Fairmont has a long-standing tradition that Junior Kindergarten & Kindergarten students from AH, NT & HAC sing the National Anthem before the Huskies take the field. In preparation, all JK/K students have been practicing the National Anthem. If you are interested in having your student participate, we are asking singers to arrive at Yorba Linda HS Stadium at 4:30 PM. All students participating should wear their white button down or red polo shirt with any bottom (jeans/blue pants). National Anthem singers along with their families will receive FREE admission into the game. Face painters, balloon artists, along with various craft and game booths will be available FREE of charge. Come out and support the Husky football team! Fairmont student athletes who come in their Fairmont team uniform will receive FREE admission into the game. At half time, all DSL/JH Flag teams and cheerleaders from all campuses will be introduced. Everyone at Historic Anaheim Preschool joined together yesterday Thursday, September 26th to celebrate the nurseryman Johnny Appleseed. He told stories to the children in how he started to collect apple seeds from cider presses. He also told the children about his various journeys to different places. Right after story time with Johnny Appleseed, each class was able to meet and take a group picture with him. 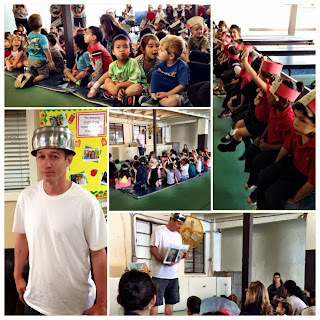 Some were able to ask questions while others enjoyed looking at his hat. Once meeting Johnny Appleseed was over, students went back to their class and enjoyed more apple treats such as apple chips, apple pies, and applesauce. They were able to learn about different kinds of apples. It's Johnny Appleseed time for most students this time of year. Kindergarten and early elementary school students get to hear about Johnny Appleseed for the first time. 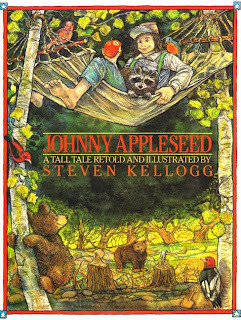 But if you have elementary-aged kids who want to learn more about Johnny Appleseed's life, Steven Kellogg's "Johnny Appleseed" is a great place to start. Your student will read about John Chapman's (Johnny Appleseed's real name) early life as a child picking apples in the fall to when he travels into the wilderness and meets native Americans. It is an entertaining biographical story that follows chronologically from childhood to the end of his life when he became a living American folk hero. Kellogg is great at melding fact and fiction while letting us know the difference. His illustrations are lively and help tell the story. If your 1st-3rd grader is interested in learning more about Johnny Appleseed, this is the perfect book. Enjoy with some apple pie, apple cider, apple fritters...! 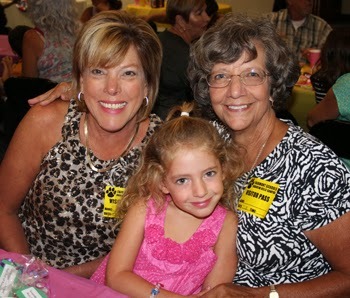 Ava W. enjoying time with her Grandmas! 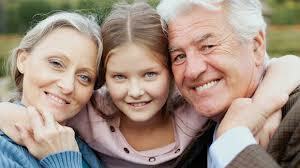 Grandparents play such an important role in the lives of their grandchildren. As a thank you, Fairmont Private Schools honors grandparents in their own special way at each campus. At the Historic Anaheim Preschool, students paid tribute to their grandparents by performing a memorable song expressing their appreciation to their grandparents. After the presentation, all students were able to have a wonderful continental breakfast with their grandparents. At the Historic Anaheim K-8 Campus, our grandparents were honored by Mrs. Luckham's class presenting flag salute with an acoustic poem about grandparents. The Preschoolers at Anaheim Hills enjoyed a yummy breakfast with their grandparents before showing them what they have been learning. Thank you to all the grandparents who came out! North Tustin celebrates Grandparents Day next Tuesday the 24th. The Fall Festival is a very special school tradition at the Anaheim Hills campus! Our Parent Association works very hard planning this event for all of our families to enjoy. We will have carnival rides, game booths, food stations, and more--you won't want to miss it! The Historic Anaheim Parent Association will be holding their Color Run (formerly known nullas the Jog-A-Thon and the Fun Run) on Wednesday, September 25th.This will not be a formal dress day due to the Color Run. Please see the attachment below for more information. The North Tustin Campus Parent Association (NTCPA) invites you to the North Tustin Campus Annual Back-to-School Picnic. Please join us for this annual tradition event featuring fabulous catered food, desserts, attractions, games and loads of fun in an Old West themed environment! This is a great opportunity to spend time with your kids and meet their friends and their families. Hope to see you all there! Fairmont has a wonderfully diverse student body and we love it when families share their cultural heritage with our students. On Thursday, September 19 many of our Chinese, Korean and Vietnamese families will be celebrating the Mid-Autumn Moon Festival. On the 15th day of the 8th lunar month, the moon is at its maximum brightness for the entire year—thereby the name Moon Festival. 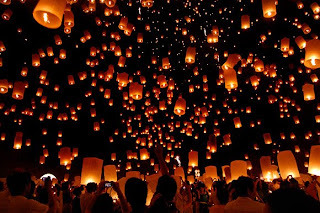 During the Moon Festival, families celebrate by gathering together with family and friends, giving thanks for a good harvest, and praying for prosperity and for a good future (kind of like the traditional American Thanksgiving celebration). Don't you love it when all of the pumpkin flavored and scented products start appearing in stores? It's that time of year, before the rush of the holidays, when there's the slightest nip in the air and suddenly you know fall is on the way. Won't be long before leaves start changing colors and you head out with your family to pick the perfect pumpkin for the Halloween jack-o'-lantern. 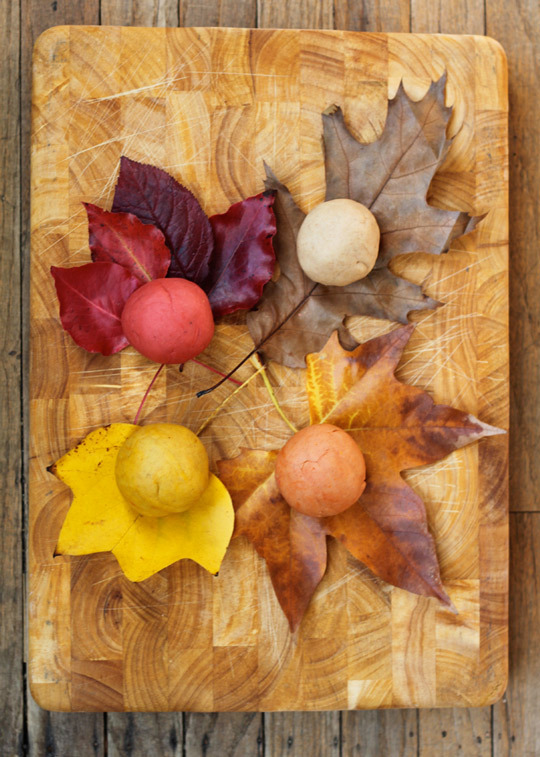 Get in the fall spirit with this delicious-smelling homemade playdough recipe from Small + Friendly (it smells good enough to eat--but don't!). Combine all ingredients (except coloring) in a large pot. Remove from pot and allow to cool until the dough can be worked by hand. Divide the dough into however many different colors you want. * Coconut oil is my secret ingredient. I makes the best play dough ever. If you haven't tried it, I highly recommend it. 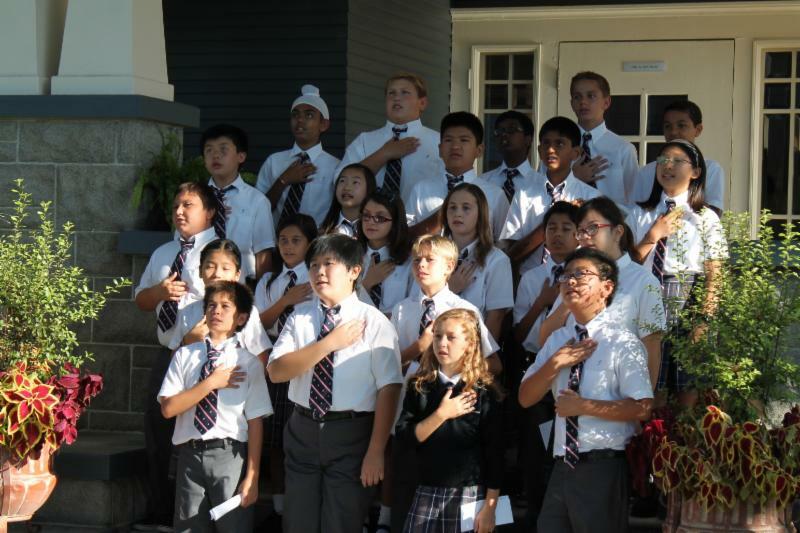 Our Anaheim Hills students remembered 9/11 during a special Flag Salute on Wednesday. 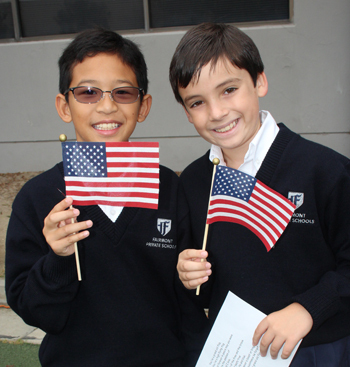 Each year, during the week of September 11th, our students do a special Patriot Day activity to pay remembrance to September 11, 2001. This year was no exception as each campus facilitated activities and lessons on Wednesday that taught students about the events of 9/11 and how our country will never forget. It's that time of year - time to say "cheese" for school photos! 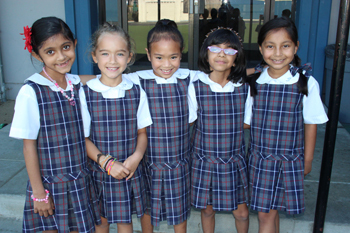 Please check your campus' eNewsletter for all the details regarding Picture Day. As a reminder, all students must wear their Formal Uniforms for their school pictures. At Historic Anaheim, our Parent Association plans a Back to School Picnic each year for all of our families to attend. We are gearing up for our 2013 event on September 20, and we can't wait to see you there! SNACK TIME do your kids need supplements? Children Who Might Need Supplements? Kids who skip meals or super active kids who play physically demanding sports might benefit from the extra calories a sports drink, a protein-fortified smoothie, or extra snack has to offer. Vitamin D helps to promote bone and tooth formation and greatly assists the body to absorb calcium. Good sources include egg yolks, and vitamin D3 fortified milk and non-dairy products (such as soy, rice and almond “milk”). An increase in the frequency of severe vitamin D deficiency is being reported in the U.S. and other countries. According to the United States Bone and Joint Initiative, this severe deficiency can have a devastating impact on a child’s bone strength. A simple blood test can determine if a vitamin D deficiency is present. The American Academy of Pediatrics and the Institute of Medicine recommend a daily intake of 600 IU for everyone over age 1. Parents should consult their primary care professional to determine the correct amount of vitamin D3 they should be taking to ensure optimal vitamin D levels. Omega-3 fatty acids are essential fatty acids meaning they are necessary for health but the body can’t make them -- you have to get them through the diet. They play a crucial role in brain function, as well as normal growth and development. Omega 3 fatty acids have also become popular because they may reduce the risk of heart disease in adults. Benefits for children are still being investigated. A small clinical study demonstrated that taking omega 3 fatty acids seemed to improve airflow, reduce cough, and lower the need for medications in some children with asthma. There are no standard doses or official recommendations for omega-3 fatty acids. If your child doesn't eat fish and seafood, the body can convert some of the alpha-linoleic acids (ALA) found in pumpkin seeds, flaxseeds, soy and walnuts into omega 3 fatty acids in the body. Although most multivitamins and mineral supplements designed for children are generally safe, you should speak with your health care provider before giving your kids any kind of dietary supplement, especially those that contain iron or are formulated for adults. Iron supplements can cause iron toxicity when taken in large amounts. Iron overdose is one of the leading causes of death caused by toxicological agents in children younger than 6 years. All dietary supplements that contain iron are required to be bottled with a child-proof lid—one that requires pushing down on the lid and squeezing to open. Don't automatically believe any label claims such as improves immune system function or increases brain function. These claims can be misleading. Don't attempt to treat any specific health conditions with supplements without the guidance of your health care provider. 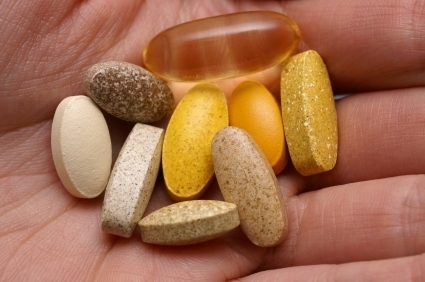 Keep adult vitamins out of the reach of toddlers and young children. 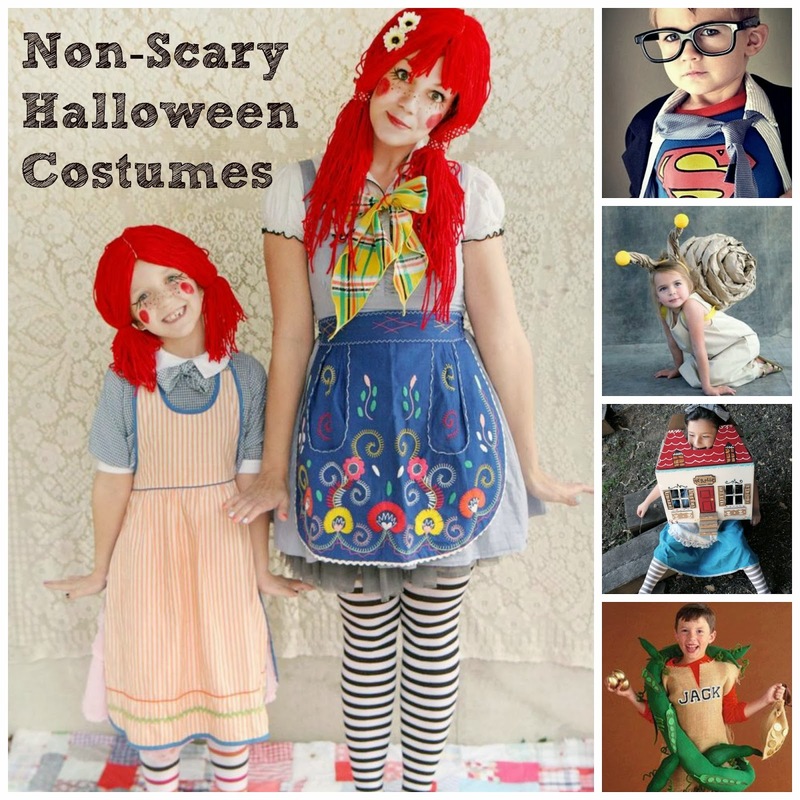 Keep multivitamins out of your child's reach and make it clear that they aren't candy. It's 3pm and school is out--the time of day that strikes fear into the hearts of moms and dads. Sure, we're super excited to pick up our children and hear about their wonderful days at school, but in 3, 2, 1... we're off to soccer, ballet, scouts, you name it! Dinner must be cooked, homework completed and doesn't someone have a special project due tomorrow?! Add in the infamous So Cal traffic it's easy to see why 3pm 'til bedtime are some of the most challenging hours for busy families. Sometimes there's just no getting around the go, go, go, but we have a few tips to make it a little less stressful for parents and kids. Create a home command center (see pic). Getting organized can be next to impossible, but once you have a good system in place life becomes easier. You'll need a place for kid stuff--back packs, lunchboxes, Friday folders, etc.--and a place for adult clutter--keys, cell phones, receipts, etc. 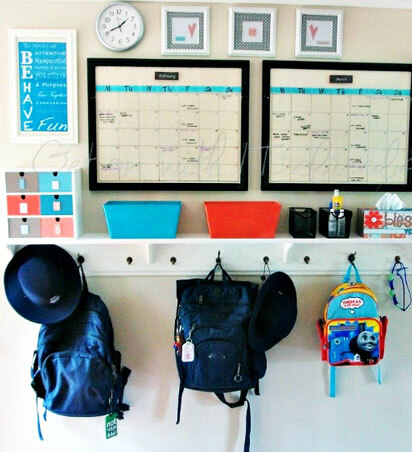 Add a family calendar, a bulletin board and a white board to keep track of schedules and reminders. For some inspiration, check out the back-to-school command centers at frugalistasdeals. Plan for the craziness. You know the routine, so outsmart Murphy and prepare for the worse. Problem: The kids are hungry, thirsty and tired after school but you have to run or you'll miss dance lessons. Solution: Pack healthy snacks and water bottles along for the ride and tuck favorite toys or books in the seat back pockets to entertain the kids. Problem: You're getting home late every day this week and dread the question, "What's for supper?" Prep and freeze meals on Sunday and rely on the slow cooker! Take advantage of public spaces. Libraries and parks are great stop-overs for families on the go. You can check emails or answer voice mails while your children play or start on homework. You may even be able to schedule a play date for little ones in between errands or appointments. Prep fun activities in advance. (This great idea is borrowed from buggy and buddy) So you know it's going to be a super busy afternoon and you may not be 100% excited when you're kids say, "Let's paint!". Set out activities in advance so that when they return from school they find art materials or a puzzle, and you won't have them reverting to TV or worse yet arguing as you prepare dinner. Enlist help. Carpooling can be a huge help when your schedules align with a friend or neighbor. It's also reasonable to expect your children to pitch in. Older kids can be responsible for packing their own lunches and snacks and making sure they have everything they need prepped and ready to go. Children of all ages can help in keeping the car clean, tidying up living spaces and setting the table for dinner. We're in the midst of a parenting climate that feeds on more expert advice, more gear, more fear about competition and safety, and more choices to make about education, nutrition, even entertainment. The result? 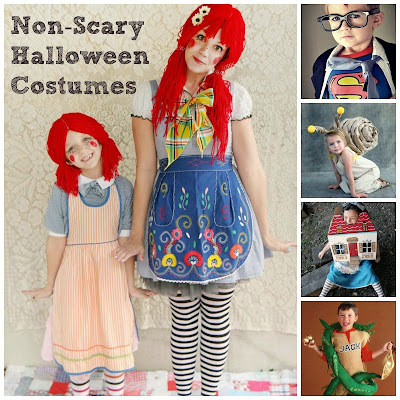 Overwhelmed, confused parents and overscheduled, over-parented kids. 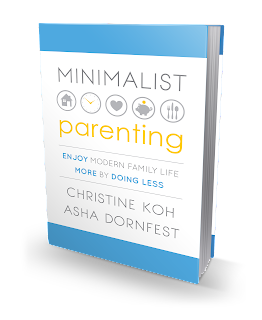 In Minimalist Parenting, Christine Koh and Asha Dornfest offer a fresh approach to navigating all of this conflicting background noise. 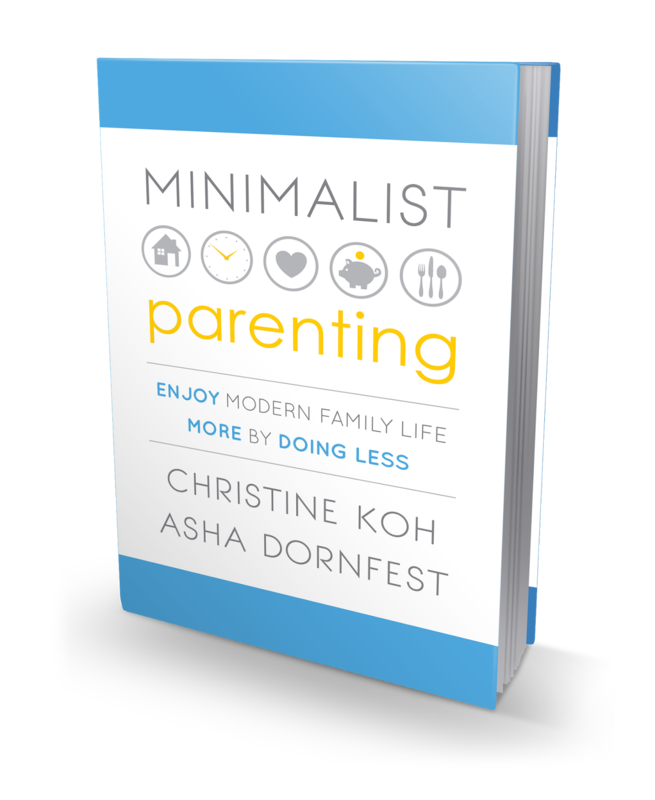 In Minimalist Parenting, Christine Koh and Asha Dornfest offer a fresh approach to navigating all of this conflicting background “noise.” They show how to tune into your family’s unique values and priorities and confidently identify the activities, stuff, information, and people that truly merit space in your life. The book begins by showing the value of a minimalist approach, backed by the authors’ personal experience practicing it. It then leads parents through practical strategies for managing time, decluttering the home space, simplifying mealtimes, streamlining recreation, and prioritizing self-care. Filled with parents’ personal stories, readers will come away with a unique plan for a simpler life.